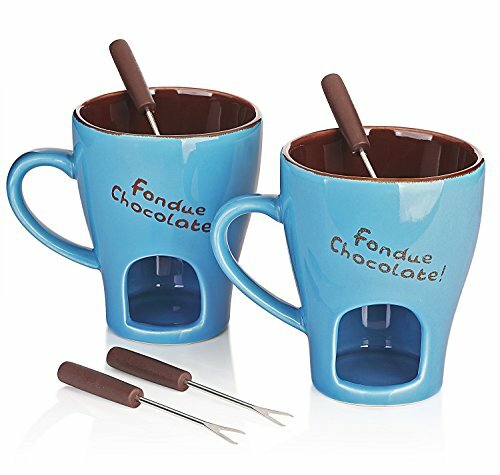 Beautiful outlook and portable size make it a perfect chocolate fondue mug for individual or couple use. They are so amazing. Looking for an elegant fondue for your romantic dinner? Add it to Cart now! You will find it goes far beyond its price. From DOWAN, leading household brand on Amazon. Search DOWAN on Amazon to get more information about the brand and its products. 1）Compared with traditional fondue, the fondue mug saves extra 70% cupboard space. Hassle-free from assembly, much easier for storage. 2）Each mug is big enough for serving two people at a time. Delicacy is always at your hand. 3）The perfect companion for outdoor travel. Pick up your family and friend, enjoy a different picnic party! 98% of the surface is covered by smooth glaze, facilitating quick hand-washing. Sized right for any type of dishwasher. Put it into dishwasher and it will come out like a shinning new mug, say goodbye to the bacterium and stain. Don't waste more time to look around for a gift. With the fantastic outlook, practical function and high value, the fondue will be a surprise for your friends and colleague! 30 DAY MONEY BACK GUARANTEE - We promise free replacement for damaged or chipped products caused by non-human factors in 30-days warranty.